Australia and New Zealand, I'll be over to see you in May & June celebrating the 50th Anniversary of the amazing, CREAM. My new Solo album #RESONATE arrives October 28th in Japan and November 4th in Rest of World. It's time ~ let it begin ~ see you soon ~ I have missed playing live ~ all is well ~ and I'm so excited to be touring this Summer, Fall & Winter. Join me to celebrate DEEP PURPLE'S Induction into the ROCK & ROLL HALL OF FAME ~ I'm looking forward to having a wonderful evening and honored to be an Inductee, may it be a grand & Glorious peaceful event... the award is for the fans... THANK YOU. I am sorry to say that some recent setbacks in my recovery from knee operations are the reason that I can't get out to see everyone as soon as I had hoped. I want to make sure I give my fans the best live experience possible and promise it will be worth the wait. I can't wait to see everyone at the shows. Lily Penelope Hughes. You will never be forgotten. To all my animal loving friends across the world... Thanks. Now Home in LA... thanks for the love and support these past 4 touring months ~ it was a tribal experience ~ I want to thank all my fans who have stood by me thru it all... you make a difference. Today is the day that WATERFALL ~ VOODOO HILL is released... "I am down on my knees"
New GH song, "White Feather", from the soon to be released Voodoo Hill album, "Waterfall". New GH song, "The Well", from the soon to be released Voodoo Hill album, "Waterfall". New GH song, "All That Remains", from the soon to be released Voodoo Hill album, "Waterfall". So honored to play for ALL OF YOU ...the South American tour has been extremely wonderful & successful ~ lots of new and old fans. And sold out shows YOU are LOVED. With our kid David Coverdale last night via my YouTube channel playlist "Fan Video" plus Kings Of Chaos & more! ...a new radio interview I did talking about my upcoming Tours / Doug Aldrich / KOC / Love and Gardening!! ...tune-in to Showtime (USA) for the Quiet Riot Movie on Thursday, Jan. 29th @ 8:00PM ET/PT & coming to iTunes, Amazon & DVD May 19th! 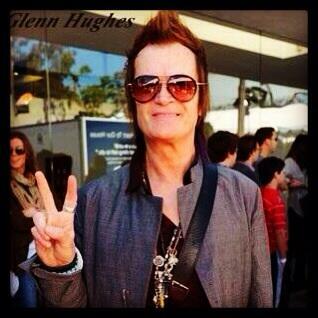 ...this is the sound of Glenn Hughes. Checkout the Orange Amplifiers AD200B MK 3. Here it is... California Breed ~ THE WAY ~ new video. "I know THE WAY that it should go". Our first lyrical video ~ Midnight Oil ~ California Breed is something special. Here it is Golden Ones ~ the video premiere of 'Sweet Tea' from California Breed. Happy New Year my Golden Ones! Happy Holidays my Golden ones. "I should have been gone ~ but I came back for more" from a new song... being recorded in Nashville. Here is a Sixx and Hughes story that Nikki and I were remembering when KOC played LA at the Avalon November 18th. It's remarkable how the two of us have walked the same path for years ~ only to find ourselves in a World of peace & love. There are NO mistakes in the universe. I did a video back in 2000 called "Days Of Avalon". We filmed the making of, and behind the scenes footage, we all had fun... something I insist on! Hope you all enjoy new BCC ~ A F T E R G L O W ~ coming October 30th, 2012. Black Country Communion - "Man In The Middle"